Hello to the Farm My Yard community. 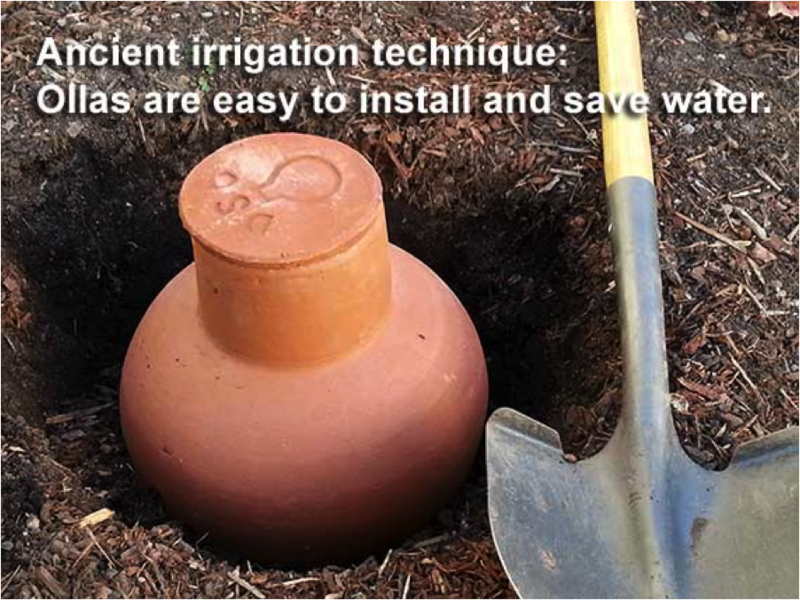 Albert has very graciously invited me to share information about an amazing irrigation technique—called an Olla—with all of you. First of all, I should introduce myself. My name is Luisa and I have a company called Plug and Play Gardens, which offers earth-friendly solutions to organic gardeners. Second, I should answer the most frequently asked question, “What’s an Olla?” An Olla is a porous clay pot. Using an Olla is really simple. You bury the pot in the ground, fill it with water and then plant flowers and vegetables around the pot. The Olla slowly releases water into the surrounding soil, irrigating your plants slowly over time. There are lots of reasons to use Ollas especially here in Portland where we have long, dry summer. Putting Ollas in your garden means that you’ll use less water and that you’ll have to water your flowers and vegetables much less frequently. You can use Ollas directly in the ground, in raised beds or in very large containers. Here in Portland I use one Olla in the middle of a 4’ x 4’ raised bed. And even during the driest part of summer last year, I was filling my Olla only once every 4 to 5 days. Using an Olla freed me from watering everyday. Best of all, using an Olla keep my veggies happy and healthy all season. You can read my Top Ten Reasons to Use Ollas on my Website at PlugandPlayGardens.com. It will be gardening season soon, and I invite everyone in the neighborhood to check out the Ollas I’ve installed in my front yard…or just come by to say hi!